Time for another food post. I post what I like. Been feeling down and stressed for the past few days. Today's about what to cook if you are lazy and have lots of complaints everyday about everything (Yes, I am talking about myself). And don't complain. It's all-chicken today. *Warning: You can be lazy to "open wok" and stir fry (and deal with the oil splatter, smelly hair, oily walls and all), but you cannot be lazy to chop and marinade the ingredients. I don't know about you, but I am ok with chopping up ingredients and marinating them, I could work very very fast on it. 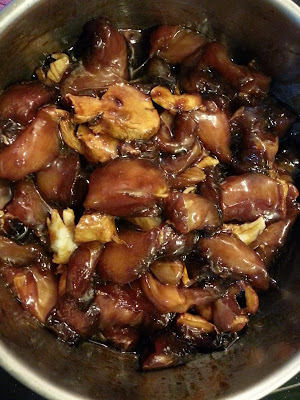 Marinate chicken pieces with sesame oil, oyster sauce, soy sauce, pepper, ginger and crushed garlic. No measurement as I agak-agak in all my cooking (and all turns out well each time, ahem). 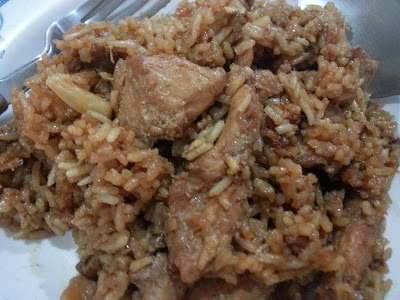 Wash rice, fill up the rice cooker with just enough water or chicken stock (in this case, I use the soup which I have boiled), chuck the chicken marinade together with the rice and soup into the rice cooker, add more oyster sauce and soy sauce, close the lid, and press "cook". *I don't have anything else in my fridge. Else, I would have added mushrooms, chinese sausages and long beans for some greens. Some people will cook the chicken first, and then dump the cooked chicken chunks into the rice cooker when the rice is almost cooked, give them a stir, and cook for another 5 minutes. But if I were to do that, then it's not "lazy" style already, right? *Note: The picture below is NOT recycled from the previous roast chicken post. 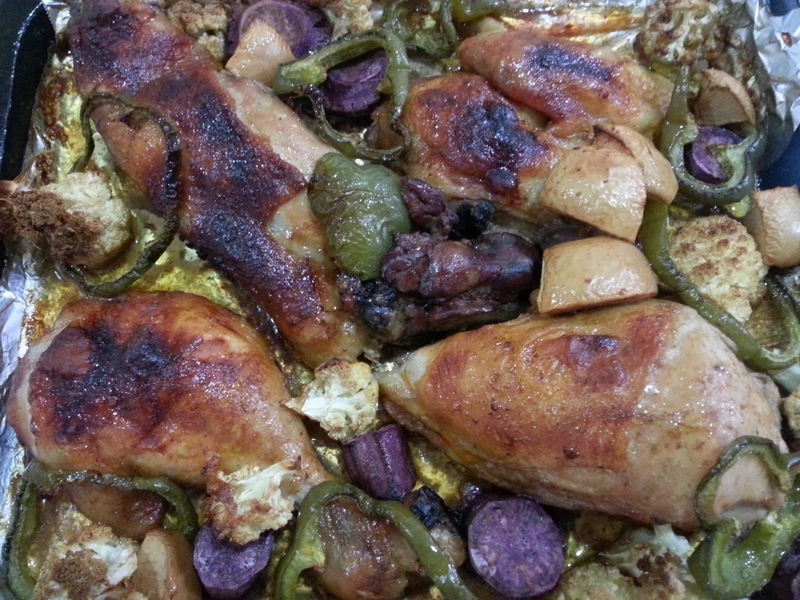 This is a different roast chicken recipe, using different marinade and vegetables. 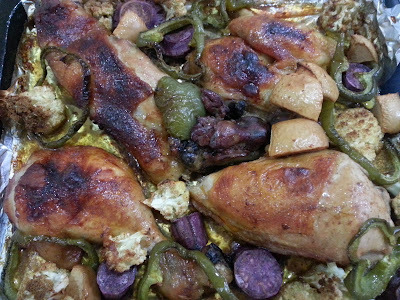 Roast chicken is one of my favourite thing to bake in the oven as I could chuck whatever I like with the chicken and marinade together. It always turns out delicious after baking. Nothing can go wrong with roast chicken. You gotta trust me on this. Even if it's just pepper and salt. The above lazy and simple roast chicken is made from just tomato sauce, oyster sauce and pepper (yeah, no kidding), together with some vegetables like bell peppers, cauliflower and (purple) sweet potatoes (the sweet potatoes will oxidize and turn slightly black if you use the orange or yellow ones, but who cares, they are covered in the dark marinade anyways). Leave for a few hours (if you have the time) and bake at 200 degrees for 1 hour or so. Before baking, as usual, generous blobs of butter on the chicken. Lastly, soup. Another simple and wholesome recipe for lazy moms like me. No oil splatter, no frying, no smelly hair. 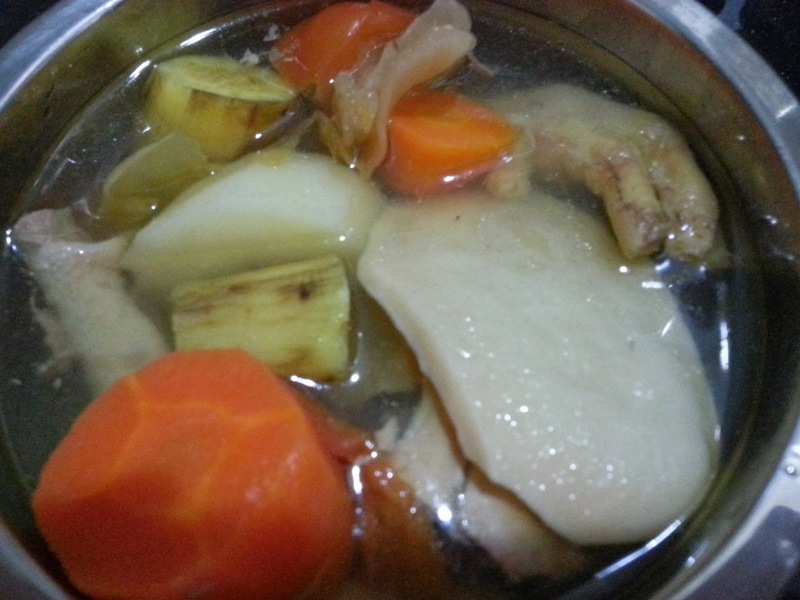 Soup ingredients: Chicken, "snail" slices (heong loh peen), potatoes, carrots, onion, sweet potatoes (optional; but for my case, it's already in the fridge for 2 weeks as it's for baby G's pureed baby food). I make do with whatever I have at home, and these 3 types of food can never go wrong on days I don't know what to cook. I will prepare everything in the morning (before the rascals wake up), and when it's almost time for dinner, I just press: "ON" on my rice cooker (to cook the chicken rice); press "ON" on my oven (to roast the chicken); and press "ON" on my Vees Delicooker (to boil the soup), and they will do the rest for me. oh, so you are another STP who likes to post all about food?? hehehe, but didn't see a lot of food posts in your blog lah.. more about rantings and complaints?? hehe.. anyway, i think the blog is a good channel to actually express yourself and also release your tension.. your readers will give you advice and also motivate you, and after reading the comments you will probably feel better, agree?? Yes, this, I must agree.. Ever since I started to comment in your blog, I have readers commenting in mine as well. I have to thank you in the first place.. It sort of gives me motivation to continue writing, be it nonsense or brainless post (brainless means I don't have to use much brains juice to write, I do not mean idiotic posts ok), as long as it reflects what I feel like expressing and like you said, sort of release my tension..
Just like when I post about Kenzie's kindergarden issues previously.. I have received valuable and precious comments that made my day.. Each and everyone of them supported me and told me I did the right thing..
By the way, eh, my blog is not like STP's, all about food.. Food in every post.. Haha.. Mine is a mixture of here and there la.. I seldom dine out, so I seldom post about eating-out & food.. So I post what I do best lor - cooking (and baking) whatever I can find in the fridge, simple and rojak meals.. No canggih gourmet food la.. Mostly "chin tan chau choy" food, hehehehe..
Yeah, that's why I mentioned, my definition of "lazy" means no need to "open wok" and stir fry and deal with oil splatters.. But I'm not "lazy" in terms of chopping up ingredients and marinating them.. So since I'm cutting up ingredients and marinating the chicken, may as well I chop somemore vegetables for the roast chicken and soup lor.. Once the vegetables has been peeled and chopped, then very senang liao.. Chuck in whatever combination into the roast chicken tray, the remaining, can campak into the soup lor.. I don't think I would call this lazy cooking! I would call your style as SMART & EASY COOKING with LouizYee! Ahem! Your chicken rice and soup looked very delicious & good to me! Thumbs up! I am a good friend of the Cooking Queen - Agnes Chang and she gave me so many sachets of ready mixed ingredients which she was endorsing as a celebrity. She told me that the ingredients inside the sachets were complete and good. Very suitable for couples working full time like us. We just need to buy meat and throw everything inside! Whoa, TM, I loike what you just wrote - Smart & Easy cooking..
Oh yes, I heard of and I know who Agnes is. Lucky you, got so many packets of free pre-mixed spices.. Oh yes, buy meat, marinade with your spices, and throw into the oven.. I wouldn't "open wok" and fry if given a choice.. If possible, I want to throw everything into the oven and let the oven do the work for me for every meal, but I know that would be impossible. Especially I am still a conventional old-fashioned "si lai" who still likes simple dishes like chin tan, chin yue and chau choy... Haha..
Eh, you very funny la.. Purposely wakeup 30 minutes earlier, then faster kautim everything, then cat-nap for 30 minutes, and then off to school? Hahahaha.. First time I heard of such thing.. You are also very funny guy wor..
Me leh, lastime wokeup as usual for school.. Took school bus ger ma, so once I stepped into the school bus, I cat-nap until the bus reached school lor..
Oh yes, SK is a very funny and cute guy like Doraemon! Do you have any suitable candidates?? Our Small Kucing's Mamarazzi is our official Tai Kum Cheh for him. Your blog and cooking pot looks no different. Anything also can blog and cook from your hearts! That's good therapy to blog and pour out our thoughts & happiness. We share out our emotions and ideas with everyone to destress!! I think bloggers will live longer and healthily instead of wallowing in pity with frustrations. I first stalked SK's blog becoz I was attracted by his comments which he left at Mamarazzi's blog (I stalked hers first, then followed by SK's, then discovered yours from his comments column).. Then, I wanted to discover your blog becos your comments sound so the real you, true, at times sarcastic yet funny, no "ka-ka" type, you un? You always have something smart to say. Ok, enuff, later SK will say I am turned on by you (or himself) pulak..
Hi Louiz! I too love simple "lazy" cooking. No artsy fartsy stuff for me. The one pot chicken rice has to be my favorite because it is so simple but it taste really, really good and I have to have two helpings. I have got to try your roast chicken because that is another favorite of mine. And the chicken soup, ah that one I do very often. Seriously, you are certainly not that lazy because you prepared 3 dishes. I would have just done a big portion of one. Now, that is LAZY! I will be "lazy" when it comes to "open wok" and thinking of stir-frying.. Very sien to deal with oil splatters and smelly hair afterwards..
Eh, mamarrazi, I wana ask you also.. You are SAHM or FTWM? Some days i can be lazy too. Dont know what to cook. So on lazy days i will just cook soups and a veggie dish. Easy. Yes, yes! Chau choy is very easy also.. But I don't "chau" la..
You know what I do? I cut up the vege, put some dried shrimps and garlic together, and put on top of the rice cooker to steam.. There is this "basket" which you can put on top of the cooker rite? There's where I put my vege+garlic+dried shrimps, and let it cook together with the rice..
Hi Kit, thanks for clicking my humble blog. Oh yes, I'm a lazy mum, hehe, always looking out for easy-to-cook dishes.